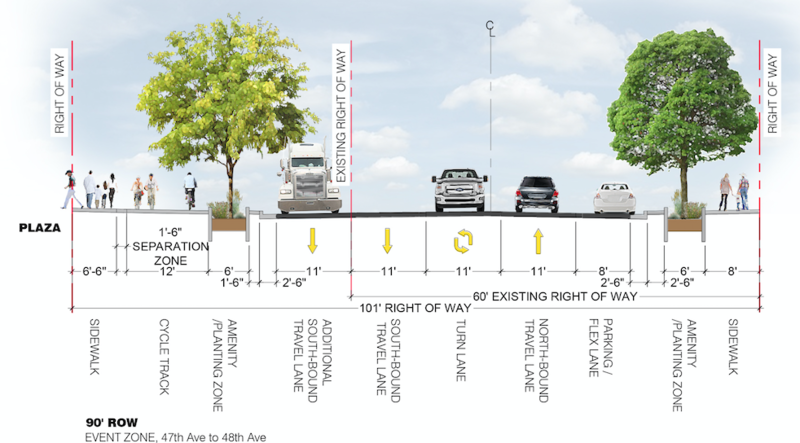 A raised two-way bike lane and new sidewalks are in the works for upper Brighton Boulevard from 44th Avenue to Race Court. But as with so many other street projects under Mayor Michael Hancock, there’s a catch: The Department of Public Works plans to widen the street — making it more susceptible to speeding and less safe to cross — right next to a new RTD station, where walkability is most important. The new walking and biking infrastructure will connect the redesigned section of Brighton Boulevard in River North to Elyria Swansea, two areas divided by I-70. The redesigned streets, with planters and trees to buffer people from traffic, will replace roads with crumbling and missing sidewalks. The project should get underway next year in preparation for the Hancock administration’s massive National Western Center redevelopment and RTD’s N-Line, with a station at 48th and Brighton expected to anchor lots of new homes and businesses. The problem with the street design is on the block right next to the station, between 47th and 48th avenues. 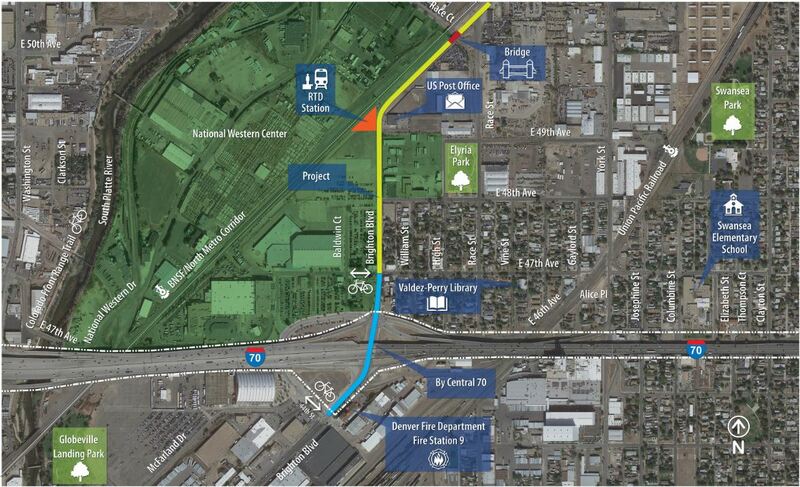 Creating a welcoming pedestrian experience here will be critical to the success of RTD ridership at this station. If walking here isn’t safe and comfortable, fewer people are going to opt for the train. But this block is also where DPW will be tacking on an extra southbound traffic lane, for a total of four moving lanes and one parking lane. The roadbed will have to be widened to make room for it. But more people will be drawn to take transit, instead of drive, if the street right by the RTD station makes them feel comfortable on foot. I love that map image which really shows how that part of town will eventually look/interact. “Let’s draw them here in cars instead of the multi-gazillion dollar rail line we just built”. That consultant should be slapped. I think the chances that national Western will be a transit draw is slim. It’s​ a right wing sort of place….Not a big transit draw. I always ride my bike to VeloSwap or anything else I’m attending there. It’s not as though there aren’t lots of different kinds of events held at National Western. I’ll counterpoint: Should we build a wide road that encourages speeding to accommodate expedient ingress and egress for one [three week] event per year? I’d argue, especially with the promise of enhanced year-round activity and new development, it’s more important to make that community as livable and safe as possible as well as make it attractive for people visiting to get there and explore the area once it develops. Wide roads are not conducive to that type of environment. The people who need and want to drive still can, but it’ll be slightly more inconvenient. At the same time, getting to and from the Downtown hotels for visitors will be a breeze once the N line is up and running. Ten dollars to park is a good incentive to do anything but drive to get to National Western, and they’re doing that already. Improve the alternatives, and more people will use them. I can park 4 blocks away for free or ride the train for 36 bucks for a family of 4? Yeah. I like the Denver choo choo. It’s just ridiculously expensive. People will use the most convenient way to get there, regardless of their politics. Politics may decide what gets built and what becomes the most convenient way of getting there, but that’s another story. Yes, people will do the cheapest thing.